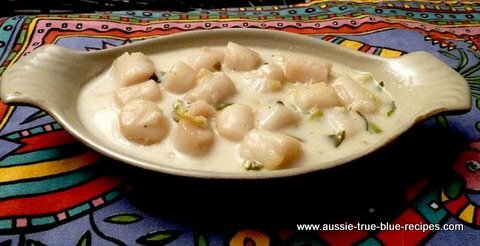 This recipe for Creamy Garlic Scallops is amongst one of my favourite recipes - tried and tested MANY times over. There is only one secret to cooking successful scallops, no matter what the recipe is - don't overcook them. If being pan-fried, Scallops need only be cooked for 1.5 minutes on each side. If being poached in milk or cream - perhaps 5 minutes on the very outside. Any longer than this, and your Scallops will resemble very expensive rubber. There are some who prefer not to leave the coral attached to the Scallop (this is the orange "tail" that is attached to the main body of the Scallop). Personally, I leave it attached, figuring that anyone who isn't keen on it can be free to cut it off and leave it on the side of their plate... I find it adds a variety and texture to the dish, and is just as delicious as the Scallop body itself. Melt butter in a pan, and add garlic, parsley, wine, salt and pepper. Add scallops and simmer for no more than 5 minutes. Uncover and stir in cream, heat but do not boil. Serve immediately accompanied with a side salad. Alternatively, you can increase the amount of cream and add some cooked wide fettucine to make the meal go further for unexpected guests.